A day after his 19th birthday, artist Jeff Maldonado Jr was killed in Pilsen. The film shares his family’s devastating loss, and celebrates the strength and love of the community that surrounded them. Produced by Pemon Rami. 1:00 Discussion with Pemon Rami and Maséqua Myers about filmmaking in Chicago today, with insights for contemporary filmmakers on the evolving economic and political conditions of media-making in the city. David Lemieux didn’t grow up wanting to be a cop, he grew up running from the cops. As a Black child on the South Side, he learned early on that the police were the enemy, and carried this attitude into adulthood as a member of the Black Panther Party. The film shares a rare glimpse into the perspective of Black law enforcement officer trying to turn around the relationship between his people and the police. Produced by Pemon Rami. Based on Sam Greenlee's iconic novel, The Spook Who Sat by the Door is both a satire of the civil rights struggle of the late 1960s and a serious attempt to focus on the issue of black militancy. Dan Freeman enlists in the CIA’s elitist espionage program as its token Black, but after mastering agency tactics, he becomes disillusioned and drops out to train young Chicago Black militants as "Freedom Fighters." This loosely autobiographical story of one man's reaction to white ruling-class hypocrisy was suppressed both during shooting and after its release, shot mostly on the fly in Gary, IN with a few scenes secretly set in Chicago. Shooting While Black: Filmmaking in Chicago, Then and Now with Pemon Rami + Maséqua Myers Presented by Cinema 53 + South Side Home Movie Project in partnership with Collected Voices. Strategies for making films in Chicago, tips for navigating the business and politics of shooting in the city, success stories of getting it done: all are on the table during this afternoon’s series of films and conversation with veteran producer/directors Pemon Rami and Maséqua Myers and film historian Jacqueline Stewart. Since the late 1960’s, Pemon Rami has been involved in the development of television, films, music concerts, documentaries, plays and multimedia productions. The first African American film casting director in Chicago, Rami provided talent for the classic feature films Blues Brothers, Mahogany, Cooley High, The Spook Who Sat By The Door, and Uptown Saturday Night. As an actor he appeared in Mahogany, The Spook Who Sat By The Door and Bird of the Iron Feather. Rami produced the feature films Of Boys and Men released by Warner Brothers starring: Angela Bassett and Robert Townsend, and the feature film 93 Days shot in Nigeria starring Danny Glover and Bimbo Akintola. Rami has also produced films and documentary projects in Haiti, Salvador da Bahia, Brazil, Trinidad and Tobago and Nigeria. He was nominated for an African Academy Award and the African People’s Choice Award for 93 Days. Director, producer, actor and curator Maséqua Myers is currently Executive Director of the South Side Community Art Center. She has served as Academy Director for the Marla Gibbs’ Crossroads National Education and Arts Center (Los Angeles), Managing Director of the Phoenix Black Theatre Troupe, Executive Director of the Independent Professional Performing Artists (Phoenix), and Director of the Ajabu (Fantastic) Children’s Theatre (Chicago). Myers is an award-winning producer, recognized with honors from the Beverly Hills/Hollywood NAACP, Theatre Awards as Best Producer and AV Multimedia Producer’s National Magazine, Top One Hundred Producers in the USA. She was awarded the Life Time Achievement Award from the African American Arts Alliance in 2008. 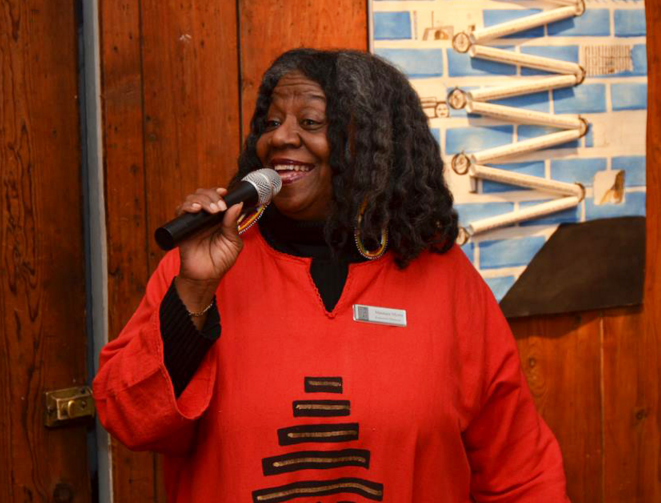 She produced and co-authored the internationally distributed educational video series Faces of Racism for the YWCA, and eight documentary shorts for the Dusable Museum on the life of Jean Baptiste Pointe Dusable.